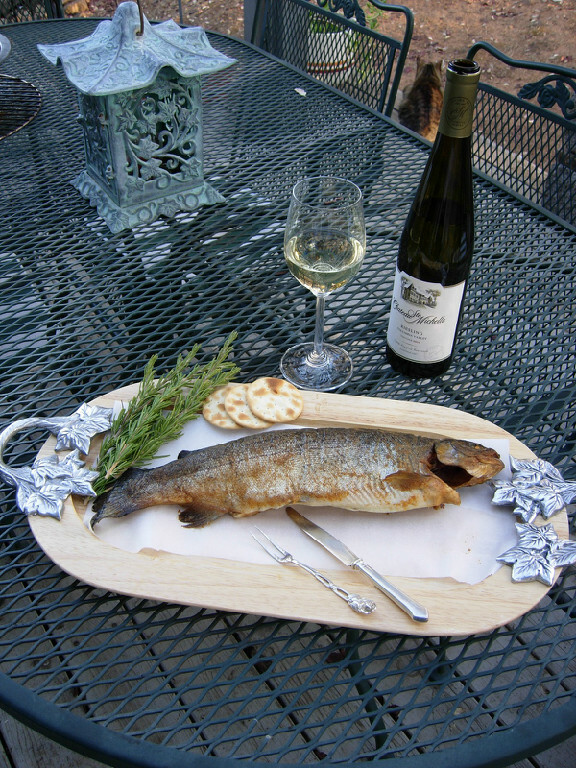 Wonderful summer pairing for evening before dinner wine… It was in Austria that we were first introduced to smoked trout. We found this delicious experience easy to duplicate for our home enjoyment. Reisling wine is a great match and our favorite. California Rieslings can be found at your local Costco or Total Wines & More for under $10. Once removed from brine, pat dry then brush with extra virgin olive oil, including the cavity. Then lightly sprinkle with seasoning salt. Smoking time is 3 – 3.5 hours. When smoking several trout, they can be individually wrapped in plastic wrap and frozen.